October has been designated as National Bullying Prevention Month. 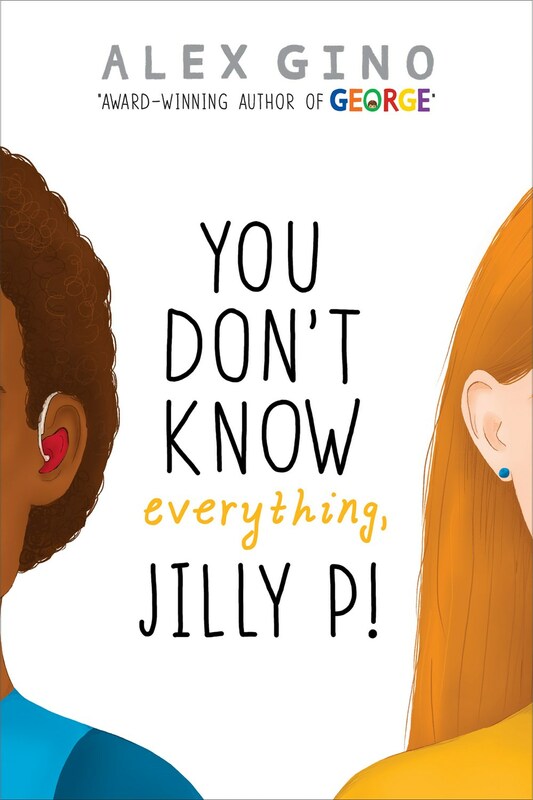 While we should always focus on the prevention of bullying, this may be a good month for readers to read books to begin conversations about bullying, and You Don’t Know Everything, Jilly P! by Alex Gino is a good place to start. Through dialogue, we hopefully can dispel some of the myths and misperception about diverse cultures and identities. Intentionally chosen literature can also serve as a catalyst for sparking conversations on complex social issues like bullying, diversity, and the effects of prejudice. An activist and advocate for LGBTQ communities since 1997, Gino uses the singular-they to refer to a mixed self. As an author of progressive middle grade fiction, they write stories that reflect the diversity and complexity of being alive. With You Don’t Know Everything, Jilly P, they write about diversity and its various manifestations. When her baby sister Emma is born, twelve-year-old Jillian Pirillo—an Italian American living in Piedmont, California—knows that things will never be the same, but she hopes they at least will get good again. Emma’s birth brings change to the family because Emma is born with a hearing challenge. The stress of a child with possible hearing loss turns Jilly’s parents into zombies “who are half-asleep instead of half-dead, in a tired dance of diapers, laundry and pamphlets about hearing loss” (65). As differently abled, Emma will need supports to cope in her world, where hearing people have advantages. Through two characters in their book—Jilly’s friend Derek Knight and her Aunt Alicia—Gino asks challenging questions, not only to provoke thought in readers but to raise our consciousness about race and difference and how racism and difference permeate our culture. Jilly meets Derek (aka profoundinoaktown) in an online forum, De La Court, the official website for news and information about B.A. Delacourt’s Magically Mysterious Vidalia trilogy. Both Jilly and Derek are readers of the books, and they frequently enter the chat room designated for “kids ages eleven to thirteen” (2) to discuss book characters, plots, and life. Through these forum conversations, Jilly, who is white and hearing, learns that Derek is Black, Deaf, and a user of ASL as his first language. While Gino includes more than one ASL-using, Deaf character, the book is from the main character Jilly’s point of view. However, because readers have access to the chats in the chatroom, we have Derek’s words directly from his point of view. Throughout these chats, we learn about Derek’s life where he attends the California School for the Deaf. When Jilly asks Derek what he knows about cochlear implants, he tells Jilly that sometimes it’s not our call to decide what is good or better for another person. He also talks about the privilege and power of oralism and how hearing people “are still trying to make [the Deaf community] like them” (118). Through Aunt Alicia, readers learn about the subtlety of racism and how “nothing changes if we don’t talk” (125). Sometimes we make racist comments, like expecting a Black person to know how to bake a sweet potato pie. While the intention is not to be racist or to hurt someone, Alicia explains how saying the wrong thing is “like the difference between stepping on someone’s foot by mistake and kicking them. Only one is mean, but they both hurt” (123). By talking about these differences, we can make progress. But not doing anything is a problem that won’t get better because nothing changes. According to Aunt Alicia, “Progress brings some dark times, but it’s still better than not growing at all” (124). Aunt Alicia also points out that everyone has a role to play, even the trickster chameleon. When Jilly makes a sign for Emma’s name and shares it with Derek, he gets angry, explaining how she “can’t just go making up signs like that . . . because it’s rude” (164). Name signs come from Deaf people. That Jilly oversteps her bounds as a hearing person offends Derek, and Jilly discovers that what we say matters and that we can hurt people even when we don’t mean to. Jillian soon learns that it’s up to her, not Derek, to figure out how to do better next time. Gino’s book gives readers hope that maybe through discourse and action society can change to a point where difference is no longer an issue. Gino writes, “But there’s a difference between uncomfortable and unsafe. And sometimes we white people need to make ourselves uncomfortable in order to help Black people feel safe” (129). Through the author’s characters, all readers should realize that often we need to help someone start a rough conversation, even if that person is an adult or our own parents. Racism is still around today—it’s in the police force and in our families, so it is up to each one of us to tackle the tough topics posed by contemporary issues—issues like privilege, power, police violence, and prejudice. As Aunt Alicia said, nothing changes if we don’t talk. This is an important book for helping young readers to learn about microaggressions and how they accumulate to create deep wounds. It is also one with potential to support young white readers while they confront their privilege and share ideas for how to support the marginalized people in their lives. We all benefit when we take the time to learn about one another. While using young adult literature as a catalyst for conversation isn’t a panacea, it does serve as a learning tool that encourages cultural border crossing, seeing from multiple perspectives, challenging dominant modes of knowing, and producing knowledge from facts. With such bridge-building, hopefully we can mitigate human cruelty and the tendency to hate, reject, or ignore what one doesn’t know or even try to understand. Because some things are invisible until they happen to us, we may be blind to ignorance and hate as diseases until we are victims or until a story opens our eyes. Tagged bullying, Deaf community, family, friendship, microagressions, police violence, privilege, racism, siblings, social issues. Bookmark the permalink.